On the morning of Monday December 7th, Luisa Reginato passed away peacefully at her home. Luisa Minato was born on February 20, 1928 in Fonte Alto, Italy. She immigrated to Canada in 1952 to be with the love of her life Roberto Reginato who had immigrated in 1951. The family moved to Santa Barbara in 1969 where Luisa’s sisters resided. Luisa worked at Wood Glen Hall for 34 years until her retirement. 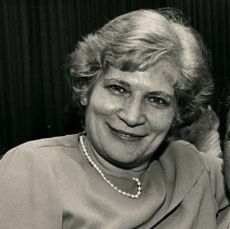 Luisa was a tranquil person, devoted wife, loving mother, and terrific grandmother. Her greatest passion was cooking for her family. She also enjoyed gardening and her roses would show her care. Luisa was predeceased by her husband Roberto, sisters Mary, Fiorina, Emma, Margaret, and Elide. She is survived by her sons Bruno (Debbie), Renato, grandchildren Jason (Becky), Anthony, Alyssa, Sefra, Dominic, great-grandchild Jacob, brother Joe Minato, and numerous nieces and nephews. The family would like to extend our deepest thanks to Luisa’s caregiver Lyuda Mila Shalayko for her loving care of our mother for two years. In lieu of flowers, please make a contribution to your favorite charity in memory of Luisa Reginato. There will be a Rosary on Thursday evening December 10th at 7:30 at the McDermott Crocket mortuary chapel 2020 Chapala St. Funeral mass will be held Friday December 11th at San Roque church at 10:00 am.